If you are thinking about volunteering in Peru and teaching conversational English, here are two testimonies about volunteering at La Molina University. I volunteered to come to Peru in order to participate in the facilitating of teaching conversational English at the National Agriculture University at La Molina. My personal reason for coming to Peru was to learn more about the culture of the people in Peru. I wanted to expand my knowledge about the people at this wonderful country. After being here for a week, I have achieved my personal objective for coming. I am witnessing how a multiplicity of people co-exist. Although the USA is older as an independent nation, the Peruvian people can teach Americans how to coexist. A person’s ethnicity in Peru does not seem to be a negative trait. Facilitating the conversational English classes have been highly enjoyable. My acceptance from the students has been a joy to my current stay. I wish I could do more than I am currently doing. The students have motivated and encouraged me to enjoy my stay here. 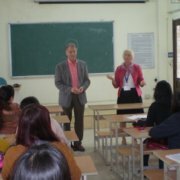 Rick in one of his classes teaching conversational English at La Molina University. The students were open, appreciative, and most gracious. In our relationship, we were able to share information candidly and respectfully. I came to hold the students in high regard and with the utmost respect. They were highly motivated and focused to achieve their academic and proficiency goals. I was continually moved by the students’ warmth and gratitude. They were so appreciative! Deb with her conversational English students at La Molina University.